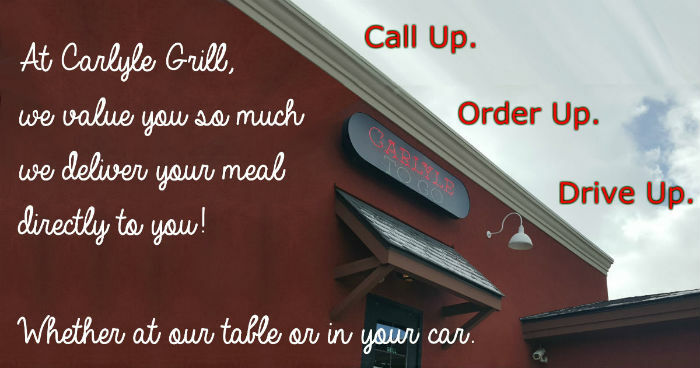 At Carlyle Grill, we value you so much we deliver your meal directly to you! Whether at our table or in your car. One of our guests joked about our servers on skates. No, you get none of that here, just simple service. Afterall, we’re safety conscious (well that and the lawyers said no when we asked). Probably thanks most to George Lucas and his “American Graffiti” we associate the local drive-in restaurant with carhops on skates, and this got me thinking. So we did a little research on the drive-in and instead found a few interesting facts about the drive-thru. Did you know that in 1948 a little known restaurant in Baldwin, California was responsible for some technology changes to the drive-thru restaurant concept? Now, there were some other claimants to the first to deliver drive-thru service but In-N-Out introduced an intercom ordering system. Today, our intercom ordering system is the phone, and you don’t have to sit idling in your car as your food is prepared and delivered at the next window. Instead, you can call from the comfort of your home or office or car, and drive-in just as your food is coming out hot from the oven from your neighborhood restaurant..
You may wonder how we know when you arrive, since you never leave your car. This a trade secret that we can’t divulge. None the matter, when you arrive we bring the meal out to you packaged and ready to takeaway. The drive-through thru changed cars as well. Cup holders were once a rarity in auto interior design, but by the late 1980s it was common for cars to feature more cup holders than passengers. Thank you History.com for your insight.